Allan, John (2008). The Eightfold Path. Retrieved 2008-03-06 from "BuddhaNet" at http://www.buddhanet.net/e-learning/8foldpath.htm. Bogoda, Robert (1994). A Simple Guide to Life (Wheel No. 397/398). Kandy: Buddhist Publication Society. Retrieved 2008-02-04 from "Access to Insight" (1996) at http://www.accesstoinsight.org/lib/authors/bogoda/wheel397.html. Ñanamoli Thera (tr.) & Bhikkhu Bodhi (ed., rev.) (1991). 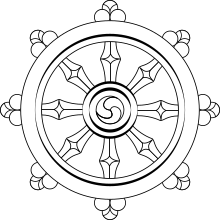 The Discourse on Right View: The Sammaditthi Sutta and its Commentary (The Wheel Publication No. 377/379; includes translations of Majjhima Nikaya 9 and the associated commentary from the Papañcasudani). Kandy: Buddhist Publication Society. Retrieved 22 September 2007 from "Access to Insight" (1994) at http://www.accesstoinsight.org/lib/authors/nanamoli/wheel377.html. Nyanasobhano, Bhikkhu (1989). Two Dialogues on Dhamma (Wheel No. 363/364). Kandy: BPS. Retrieved 2008-02-04 from "Access to Insight" (2005) at http://www.accesstoinsight.org/lib/authors/price/wheel363.html. Rahula, Walpola. What the Buddha Taught. New York: Grove Press, 1974. আইএসবিএন ০-৮০২১-৩০৩১-৩. Rewata Dhamma. The First Discourse of the Buddha. Somerville, Massachusetts: Wisdom Publications, 1997. আইএসবিএন ০-৮৬১৭১-১০৪-১. Snelling, John. The Buddhist Handbook: A Complete Guide to Buddhist Schools, Teaching, Practice, and History. Rochester: Inner Traditions, 1991. ISBN. Sri Lanka Buddha Jayanti Tipitaka Series (SLTP) (n.d.). Avijjāvaggo (Samyutta Nikaya 44 [Sinhalese ed. ], ch. 1, in Pali). Retrieved on 16 July 2007 from "Mettanet - Lanka" at: https://web.archive.org/web/20130320175202/http://metta.lk/tipitaka/2Sutta-Pitaka/3Samyutta-Nikaya/Samyutta5/44-Magga-Samyutta/01-Avijjavaggo-p.html. Thanissaro Bhikkhu; tr. Magga-vibhanga Sutta: An Analysis of the Path (Samyutta Nikaya 45.8), 1996. Retrieved 25 June 2006 from "Access to Insight" at http://www.accesstoinsight.org/tipitaka/sn/sn45/sn45.008.than.html. Thanissaro Bhikkhu. Abhaya Sutta: To Prince Abhaya (On Right Speech) (Majjhima Nikaya 58); 1997a. Retrieved 20 July 2007 from "Access to Insight" at http://www.accesstoinsight.org/tipitaka/mn/mn.058.than.html. Thanissaro Bhikkhu. Avijja Sutta: Ignorance (Samyutta Nikaya 45.1); 1997f. Retrieved 2008-02-04 from "Access to Insight" at http://www.accesstoinsight.org/tipitaka/sn/sn45/sn45.001.than.html. Thanissaro Bhikkhu. Cunda Kammaraputta Sutta: To Cunda the Silversmith (Anguttara Nikaya 10.176); 1997b. Retrieved 19 July 2007 from "Access to Insight" at http://www.accesstoinsight.org/tipitaka/an/an10/an10.176.than.html. Thanissaro Bhikkhu. Kevatta (Kevaddha) Sutta: To Kevatta (Digha Nikaya 11); 1997c. Retrieved 19 July 2007 from "Access to Insight" at http://www.accesstoinsight.org/tipitaka/dn/dn.11.0.than.html. Thanissaro Bhikkhu. Maha-cattarisaka Sutta: The Great Forty (Majjhima Nikaya 117); 1997d. Retrieved 2 October 2006 from "Access to Insight" at http://www.accesstoinsight.org/tipitaka/mn/mn.117.than.html. Thanissaro Bhikkhu. Samaññaphala Sutta: The Fruits of the Contemplative Life (Digha Nikaya 2); 1997e. Retrieved 19 July 2007 from "Access to Insight" at http://www.accesstoinsight.org/tipitaka/dn/dn.02.0.than.html. Thanissaro Bhikkhu. Canki Sutta: With Canki (excerpt) (MN 95); 1999. Retrieved 20 July 2007 from "Access to Insight" at http://www.accesstoinsight.org/tipitaka/mn/mn.095x.than.html. Thanissaro Bhikkhu. Maha-satipatthana Sutta: The Great Frames of Reference (Digha Nikaya 22); 2000. Retrieved 18 July 2007 from "Access to Insight" at http://www.accesstoinsight.org/tipitaka/dn/dn.22.0.than.html. Thanissaro Bhikkhu. Vanijja Sutta: Business (Wrong Livelihood) (Anguttara Nikaya 5.177); 2001. Retrieved 2 October 2006 from "Access to Insight" at http://www.accesstoinsight.org/tipitaka/an/an05/an05.177.than.html. Thanissaro Bhikkhu. Micchatta Sutta: Wrongness (AN 10.103); 2004. Retrieved 2008-02-04 from "Access to Insight" at http://www.accesstoinsight.org/tipitaka/an/an10/an10.103.than.html. Thanissaro Bhikkhu. Saccavibhanga Sutta: An Analysis of the Truths (Majjhima Nikaya 141); 2005. Retrieved 18 July 2007 from "Access to Insight" at http://www.accesstoinsight.org/tipitaka/mn/mn.141.than.html. Watson, Gay. Buddhism Meets Western Science. Retrieved 12 June 2012. Alexander Berzin, October 2007at http://www.berzinarchives.com/web/en/archives/sutra/level4_deepening_understanding_path/path/eight_branches_arya_pathway_mind_ei.html "The Eight Branches of an Arya Pathway Mind, (The Eightfold Noble Path)"
Sangharakshita, The Buddha's Noble Eightfold Path, Windhorse Publications, 2007. আইএসবিএন ১-৮৯৯৫৭৯-৮১-৮.